Making your own art is the easiest way to add a touch of your unique personality to your home. 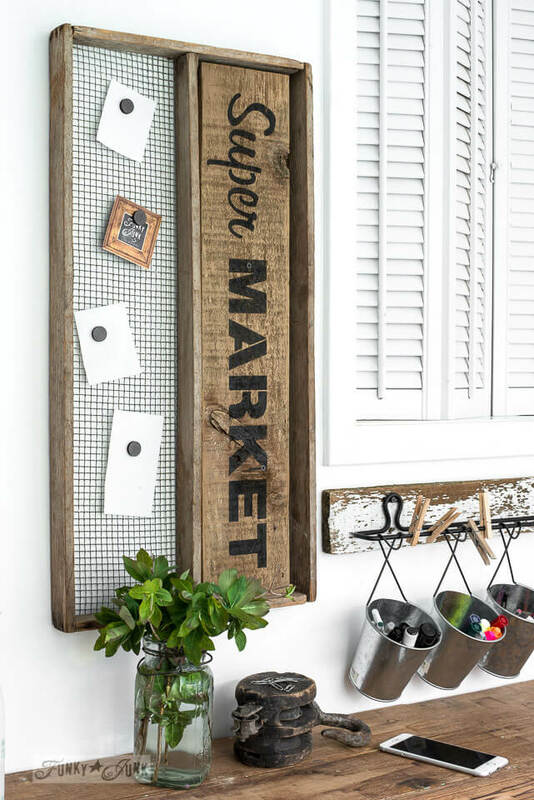 If you want to give your living space a rustic or vintage feel, try one of these 30 awesome DIY pallet signs. 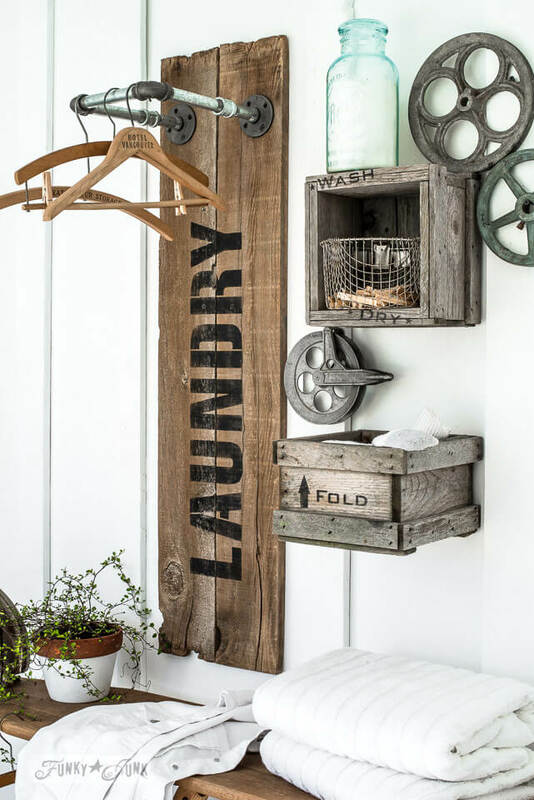 This list has DIY pallet sign ideas for every room in the house from the laundry room to the kitchen to the bedroom. There are even projects for your outdoor spaces, too! 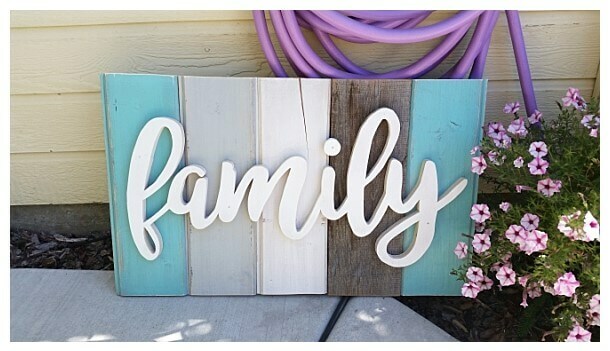 Greet family and friends with a warm “Welcome” sign or spruce up your back yard with one of the outdoor garden pallet signs. 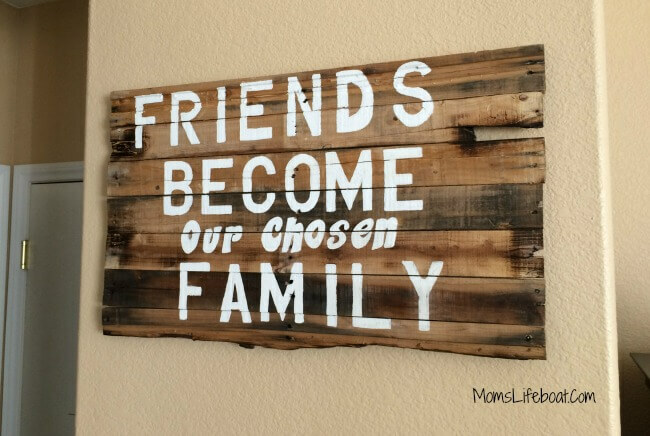 Show guests what your family is all about by adding a quote to your DIY art. You can use one of the ideas on this list or use one of your own favorite sayings. 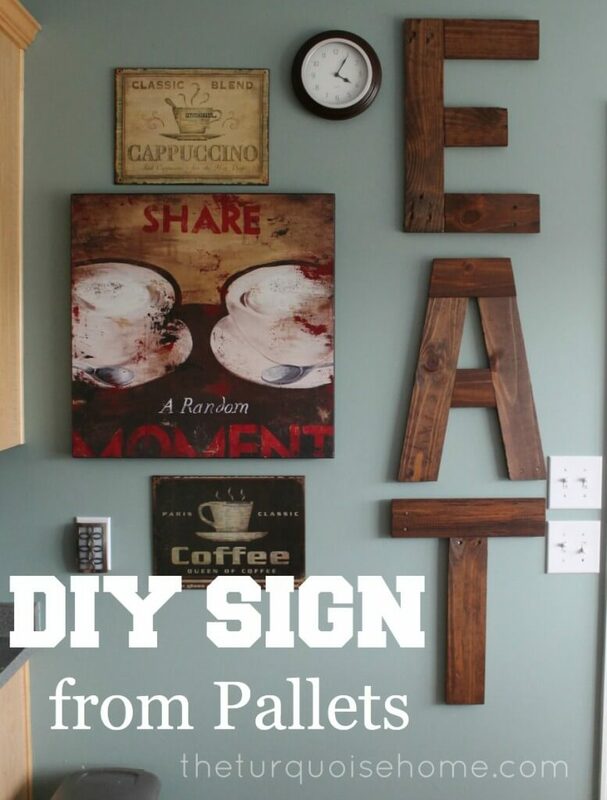 All of these DIY wood pallet sign projects are super easy to make and can be done in just one afternoon. 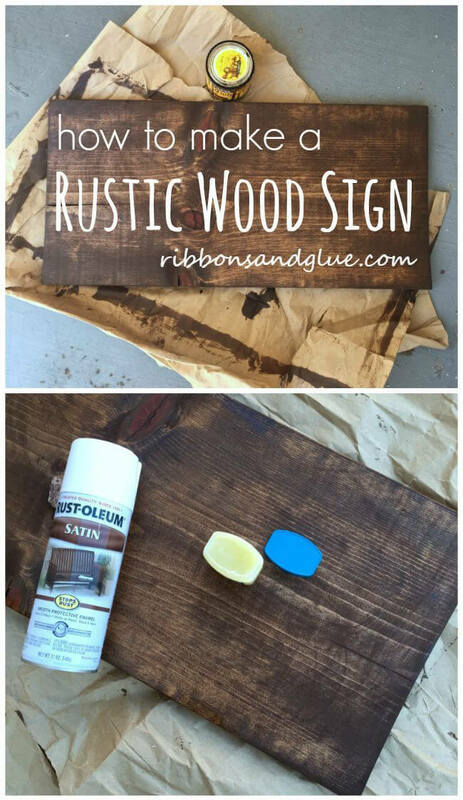 Grab a pallet, some paint and stain, and a brush and get started! Not only are these projects pretty, many of them are also functional. 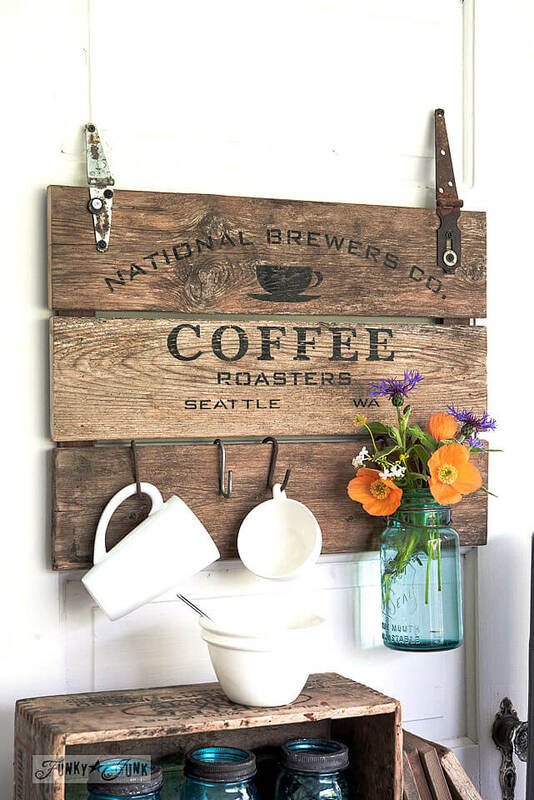 With shelves, bulletin boards, hanging racks, and coffee cup hooks, you can be organized and stylish. 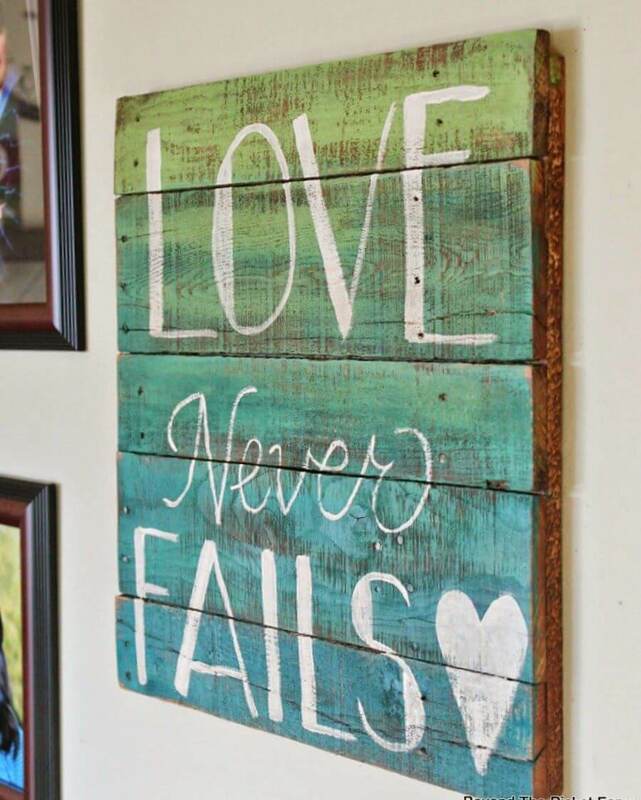 Check out all 28 DIY pallet signs and find your favorite! Inspirational quotes are uplifting and personal on so many levels. 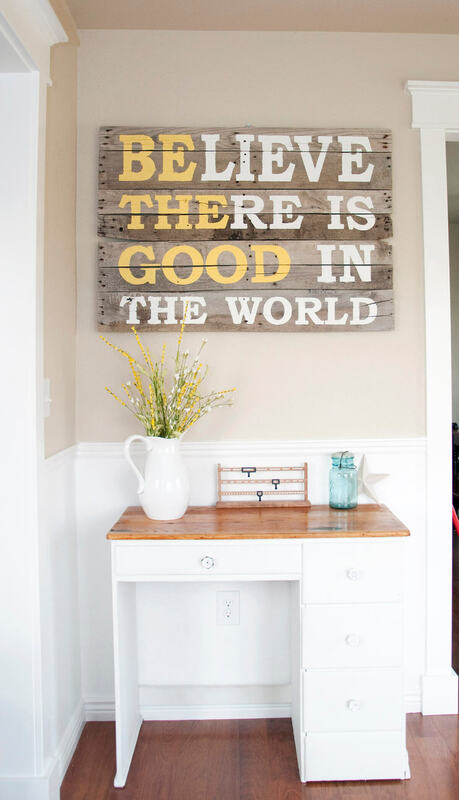 Sometimes we all need a reminder to focus on the good in the world and this attractive artful plaque does just that. Humbling tones of white and gold create an essence of purity that will keep these words close to your heart. These numbers add up to a memory far greater than any picture ever could. 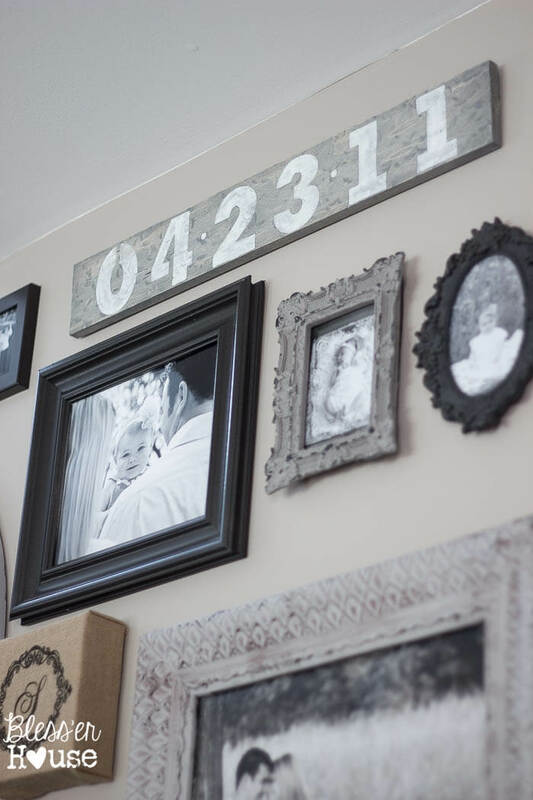 The date of your wedding is displayed in bold block numbers on a comforting rustic wood background. Place prominently on a wall where it will always be a constant reminder of your special day and the one that you love forever. Love says it all with this creative piece that will aid in erasing your daily stress. Simple and rustic, a handle holds one end, symbolizing how doors can always be opened. Love is written in cursive with twine that adds depth. Use as a headboard as a reminder of the simple and meaningful treasures of life. Show your family and friends what makes life important to you. This loving distressed sign will announce your feelings about your home. 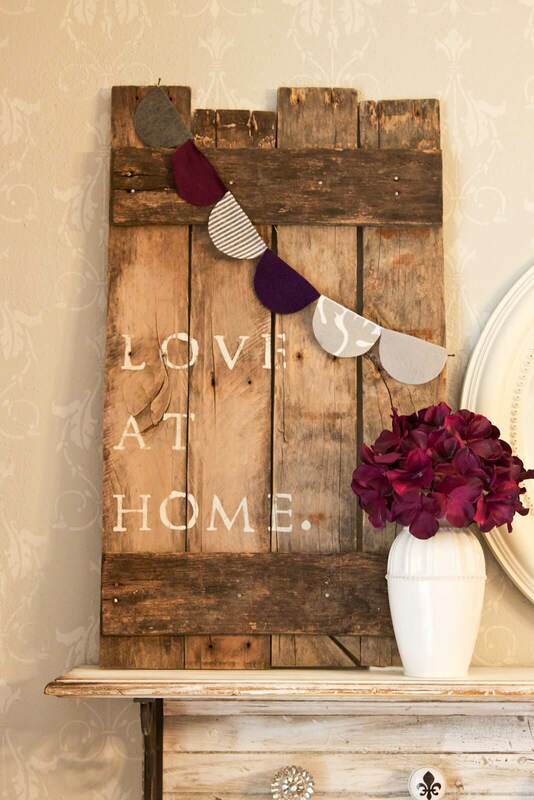 Presented in warm blues and greys, this wooden sign is adaptable to be used in any room. The whimsical cursive white letters will bring a smile to your face each time you see this sign. The sign that says it all. This beautiful large wall hanging announces your own personal version of how love should always be remembered. 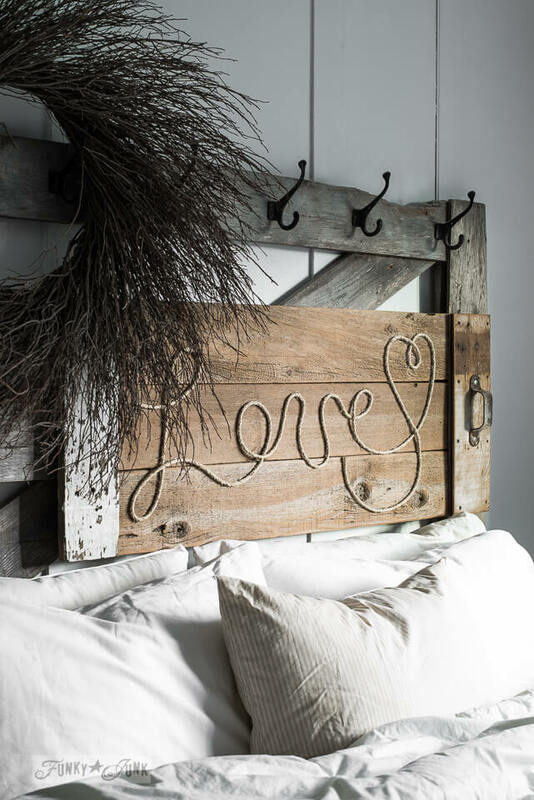 It will fit perfectly above your bed and the different stylish letters will catch your attention often and deliver those joyous and precious memories. Your mate will find it refreshing, as well. 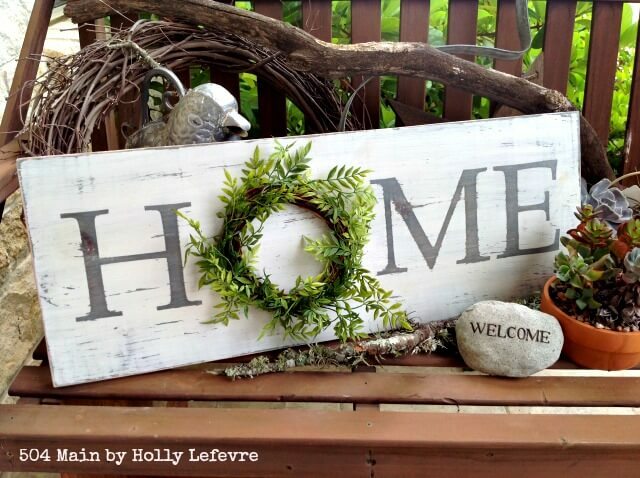 Add a little nature to your welcome sign that can be used wherever friends and family gather. Perfect for entrances, gardens or patio areas, eyes will be drawn to its playful beauty. If you are looking for that special handmade sign to brighten up your area, use a touch of nature. If you are looking to make a creative gift for a wedding or an anniversary, search no further. This rustic remembrance of old-fashioned enduring love is witty and charming. The mixture of wood and silver add an instant spark to any counter or dresser with instant blissful memories. Want to show others how easy DIY pallet crafting can be? Use this ‘tell-all’ display to point out the different ways to achieve your own creative look. 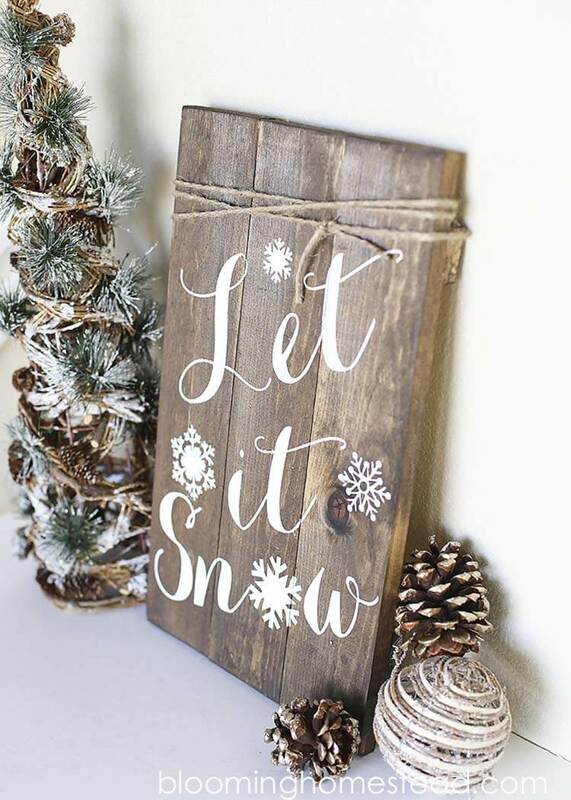 Use on your website, take to shows or hang on your front door before a class in pallet crafting. It will add interest and intrigue to what lies ahead. Never let a stamped pallet go to waste. Finding an antique wood piece can provide just the feeling that you need in creating a rustic presence in your home. Highlight your sign with old hooks, handles or hinges to add depth and intrigue to your awesome find. Further, decorate with colored ceramics or blooming plants. A wood pallet can be as unique and attractive as your mind imagines. Learn the basics for preparing your masterpiece by securing the planks. Next, decide if you want to paint or stain the background. Choose stencils or letters that are proportionate to your board and add your favorite saying or message. Seasons are the perfect way to show off your DIY skills with pallets. Winter time blues will fade with this twist of snowflakes and twine. The crisp clean magic of the snowy days will make you look forward to the refreshing winter season. Use white or light blue lettering or highlight with sparkles. Large letters that spell out a message will grab everyone’s attention. Make a paper pattern, cut the pieces to size and bind together with brackets and small nails. Stain or paint your letters to match your decor and surround with wall hangings. Save your patterns for other artful letters to display. 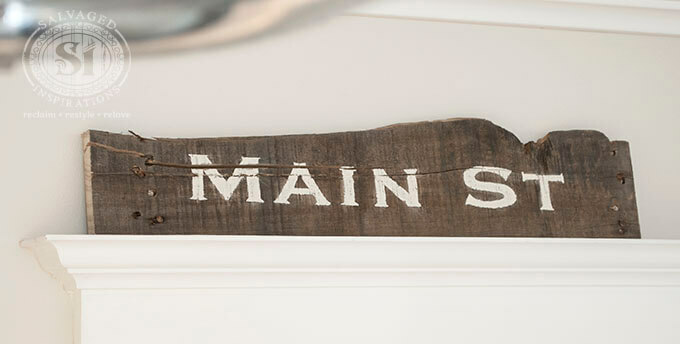 Write a popular message with natural twine or rope and add a creative twist to your sign. The letters will rise from the platform and stand out in an artful display. Use your imagination to add character, such as an arrow as shown here. Practice on the loops before securing with glue. Make your message stand out by using 2 signs nailed together. It will give depth and added texture. Use multiple shades of color to enhance the style of your room. Bold letters will deliver your personal feelings of what is felt in your home. 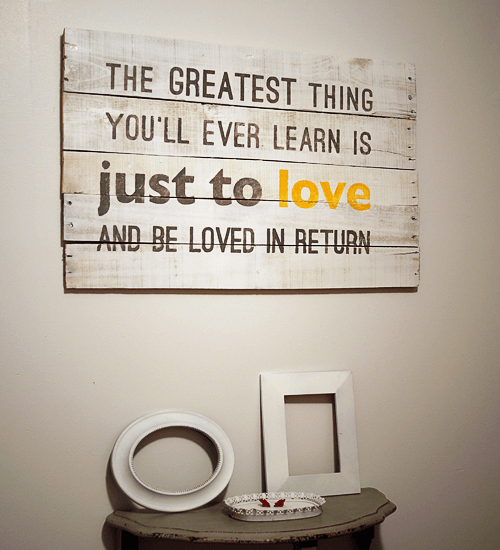 Perfect for a bedroom or family room. 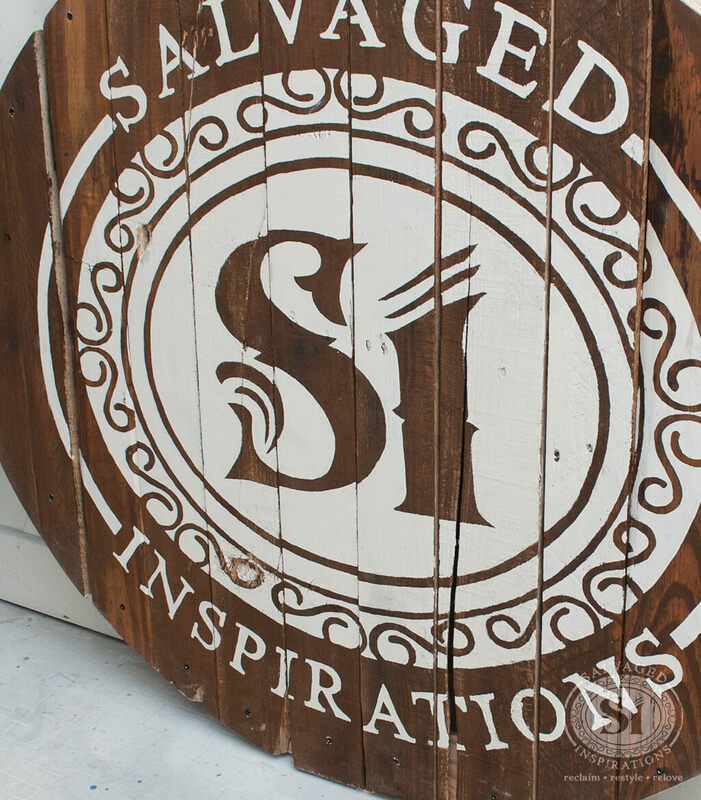 Any handmade design or crest is possible when you have a pallet at your disposal. Choose your shape and make it happen. The beauty of the rustic look is that edges never need to be perfect. In fact, the rougher, the better. Use a pattern and paint your desired theme for an original and fantastic work of art. Not all art is nestled neatly in a frame and perfect in form. Use street art to define who you are and boost your room with character. Perfect for adding a touch playfulness to bare white walls, over doors or kid’s rooms. These little signs will remind us that we all need a little fun in our lives. The industrial look is becoming more and more common in homes. Use your laundry room to demonstrate how this presence can be both attractive and useful. Old pipes mounted on tired-looking pallet pieces is the perfect way to show off a new look to a boring area. 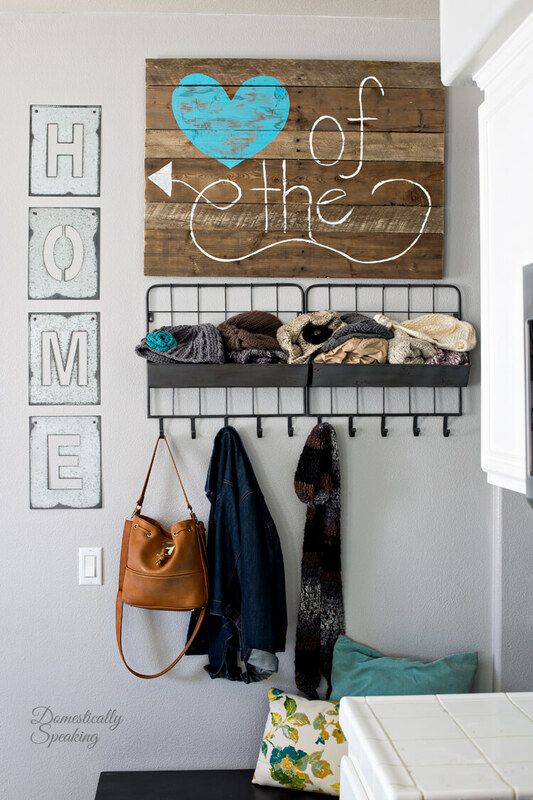 Add a message to make your hanger complete. Think outside of the box and create a fresh new look. 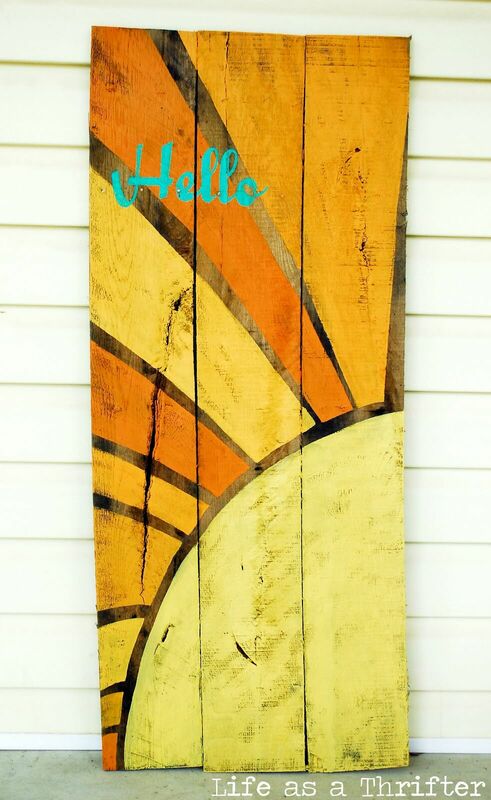 This sunny piece is attractive and unusual enough to add art to any area. The curves and lines are simple but intriguing and the message is clear. Pick out your favorite sunny colors and make your sign really unique. This clever display of family life places a feeling of serenity for those arriving home after a rough day. It will remind family members how to complete their lives are and how comforting home is when they walk through that door and shed the day’s worries. A simple and creative message. 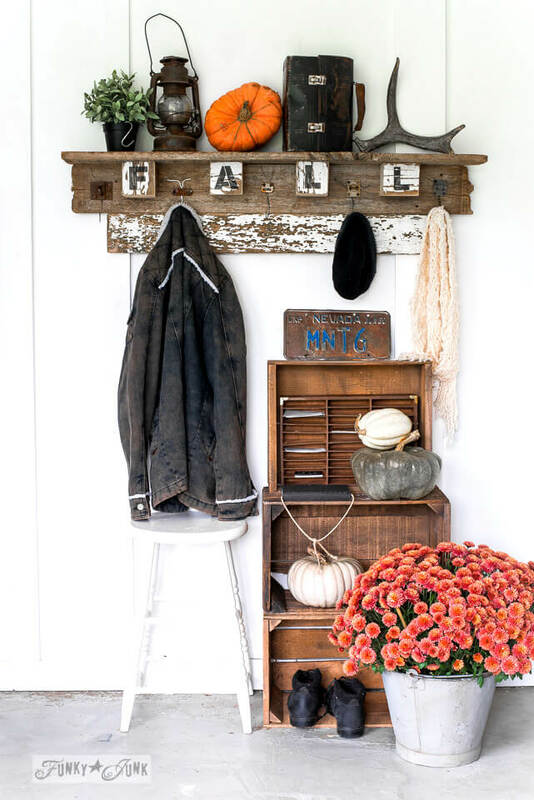 Bring that special feeling of fall to your home with this coat rack that says it all. Just as the jackets are coming out, your family will feel the joy of a new and refreshing season each time they journey outside. Dress it up with items and colors of the upcoming months. Here are imperfection and perfection at its finest. A tattered and worn sign with a spray of delicate fabrics let you know that life is not always easy, but the love at home makes it all worthwhile. Set on a mantle, dresser or bookcase to always remember its important significance. Here is a message that is appreciated by those who you want to feel welcomed in your home. 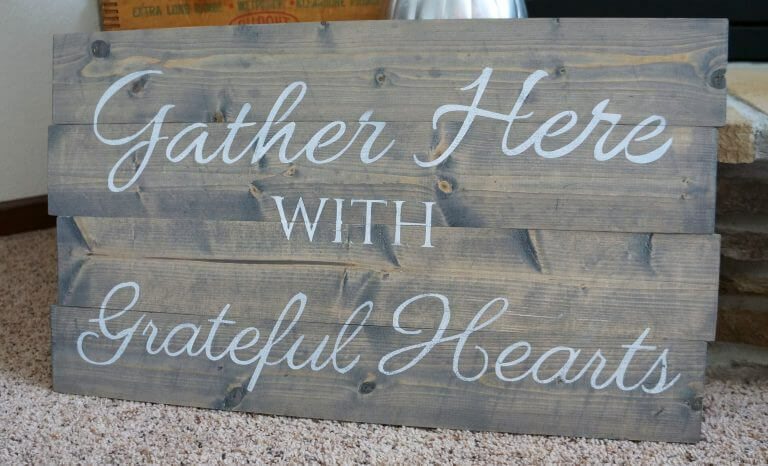 Easy to make by staining boards and adding block letters, the implication will be ingrained in those you have come to love. Place where it will be easily seen by all. How many times do you make a trip to the market only to return home without an item? This creative box will allow everyone in the family to post needed supplies. A magnet against wire mesh will hold notes in place. This will soon turn into the go-to place for messages of all kinds. 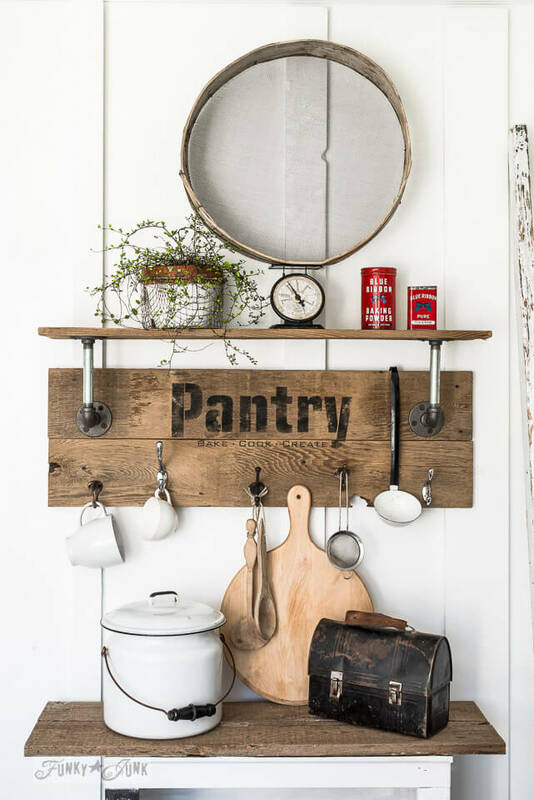 An industrial style catch-all for pantry items is always welcome for those odds and ends that seem to end up on the counter. Piping and metal hooks let you create your own version of how much space you need. Add more hooks or more shelves depending on your need and taste. 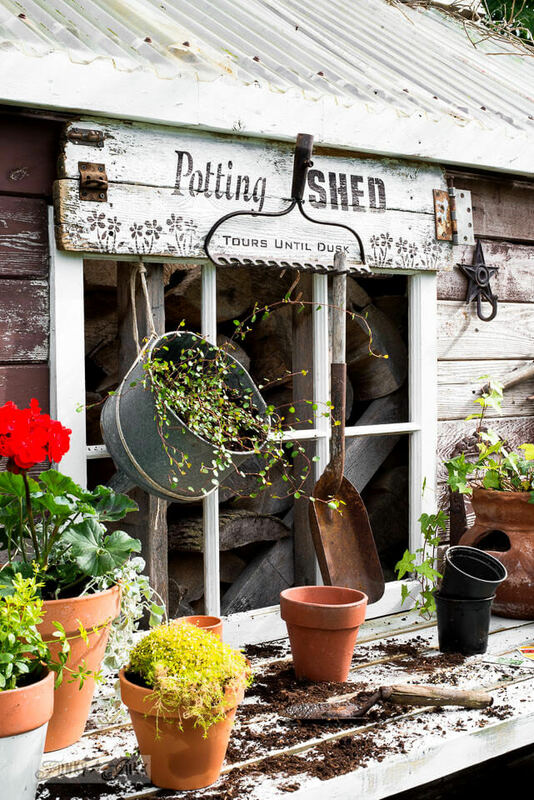 Your potting shed is your second home. Proudly let people know where you will be during the growing season with this unique sign. Make it as plain or as fancy as you like to announce your whereabouts. It will also give you a sense of pride as you work your plants. 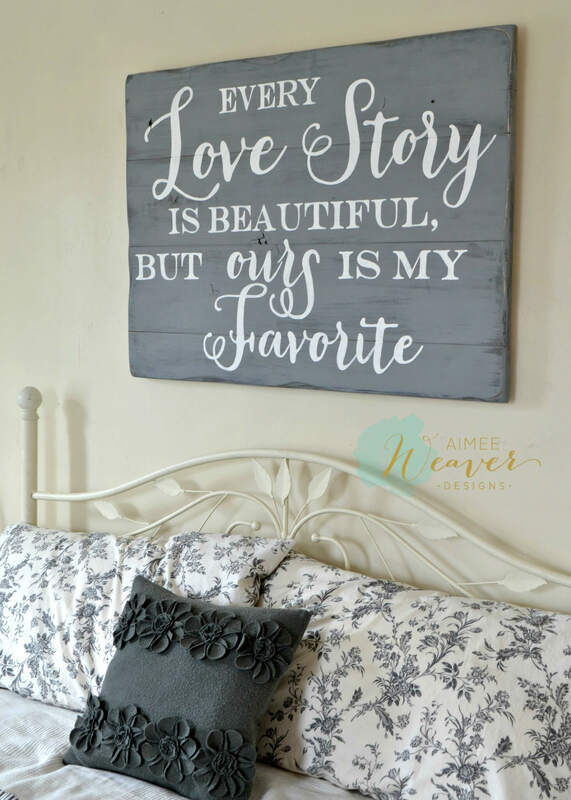 Learn the step-by-step procedures that are suggested in making your own inspirational or love quote sign. What you will need, measurements, methods, and steps will guide you through the proper way to create your own DIY project that is stunning and lasting. You will be a pro in no time at all. 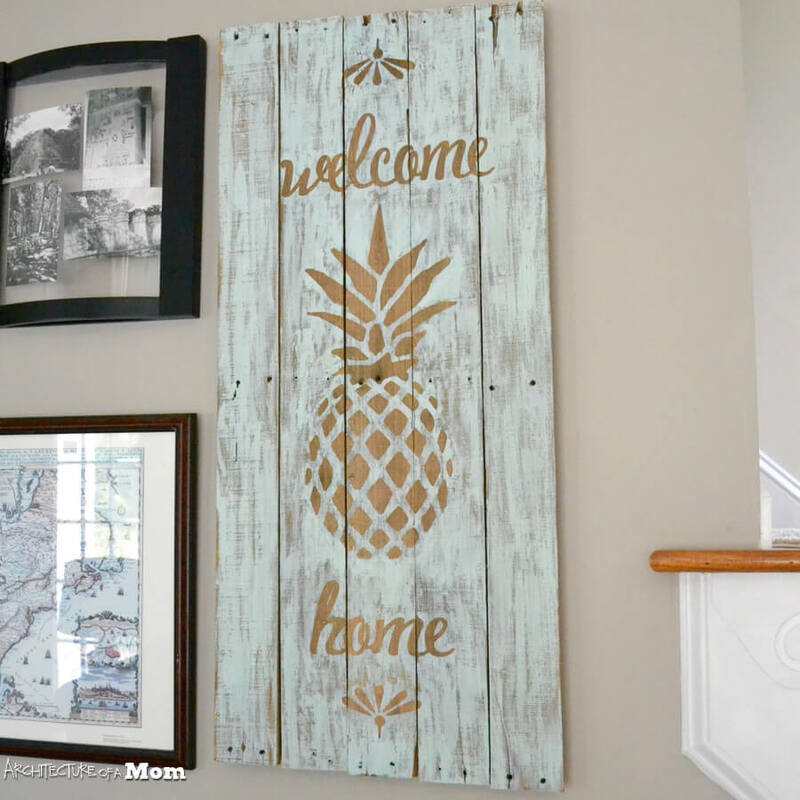 Warm and charming, this pineapple is a perfect way to add a little spice to an empty wall. A slightly brushed background sets the scene for a natural and sweet display of goodness. Gold metallic paint gives a classy look that blends with all types of decor. Its presence will be welcome anywhere.